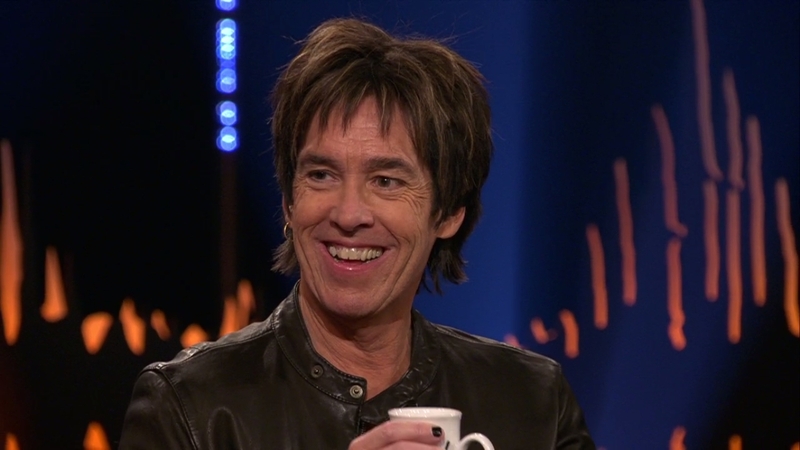 As you already know, Per Gessle appeared on Skavlan talk show tonight. From the video teasers (selfie; desert island) we saw on SVT’s website during the day we could be absolutely sure that the show was going to be much fun. The recording took place on 15th March and 2 hours before showtime Per shared a rehearsal video from his 14th March get together with the band and Lars Winnerbäck on his YouTube channel (GessleHomeVids), which we hope he will keep alive for a longer time and share even more content in the future. The first 2 guests in Skavlan were Annika Falkengren (actual President and Group Chief Executive of the Swedish bank, SEB) and Jo Nesbø (Norwegian writer, musician). Mr. G was the third guest, his part starts at around 25:40. Before he entered the studio, some old concert and TV show footage was shown from Per’s early and later career (Gyllene Tider, Roxette, solo) and after he sat down, Fredrik Skavlan, host of the show was chatting with all 3 people, asking interesting questions. Since Annika is one of the guests, Fredrik asks Per what type of bank client Mr. G is. He says he is a weak banker. Then Fredrik goes on asking who Per was before he became a musician. Per says he can’t remember, it was so long ago, but he thinks he was a shy and lonely guy. Music became his life quite early. Already at the age of 6-7-8 he was listening to The Kinks and then The Beatles. Fredrik asks Per what his father thought about him choosing music. Per says his father died in 1978, but he wasn’t fond of his musical efforts. He heard one song on the show Bandet går and thought Per was singing like shouting badly. Fredrik asks Per if he would have chosen this career if his father wouldn’t have died, but Per doesn’t know the answer. He says his mother always supported him. His dad died the same day a big article about Gyllene Tider appeared in Expressen. They talk about Per being called a mom’s boy and that she and Per’s brother and sister died during the past 3 years. Fredrik asks Per what his mother would say was the peak in Per’s career. Per tells she lived with her mother for a long time and she witnessed all the weird things during the golden age of Gyllene Tider, like getting 3000 postcards or fans stealing the drying clothes from their garden. Then it was different with Roxette, it was more of a global thing. But he tells his mum was very proud of him. Fredrik says people talk about Per as the boss. Per says he is more of a control freak. Fredrik asks if it has always been easy to work together in Roxette. Per replies ”piece of cake” and laughs. He says they started from nowhere and it was a fantastic journey with Marie. But of course, there were conflicts. Per always wanted to work and when they finished something he wanted to work again, but Marie didn’t think the same way. And probably Per’s control freakness also caused some conflicts. Fredrik asks if Marie has ever told it to Per and Per replies he read that in Marie’s book and laughs. Fredrik Skavlan asks Per if he is a pedant. Per says he is. If Fredrik goes to his home he would for sure think a pedant lives there. All records are sorted on the shelves in alphabetic order, for example. He was like that already as a kid. He tells his friends think it’s fun to push some books in on the shelf when they visit him. Here Jo Nesbø says all guys put the records in alphabetical order but asks Per if he also puts the records in chronological order for one band. Per says no, he doesn’t do that. Jo says then everyone can calm down. Haha. Fredrik says both Lars Winnerbäck and Per Gessle are introvert guys. He is wondering who talks most. Per laughs and says they sit silent. Then Fredrik asks Mr. G what small town talks (småstadsprat) Per knows about himself. He says he loves Halmstad and he really feels that Halmstad is proud of him. He says it’s always fun to fuel the car. Then Fredrik asks if he drives the cars Per has in his collection. It’s like having a horse inside the house. Per says of course he drives them. Mr. G talks about how it is to drive his Ferrari to the ICA (Swedish supermarket) to buy strawberries. He says he thought a Ferrari is a girl magnet, but it’s not at all. Everytime he leaves the shop, coming back to where he parked the car there are like 30 guys filming his Ferrari. Per also talks about that since he was 20 he got used to the fact that people recognize him. He can’t leave his apartment without bumping into people who want to take a selfie with him. Actually, if nobody asks for a selfie, he gets very depressed. Then Fredrik comes close to PG and they pose for a selfie. Fredrik asks Per what kind of car Annika’s husband should buy when they move to Switzerland and Mr. G suggest a 2-seated with no roof. Here Annika tells Per once she was sitting behind Per on a plane and Mr. G was reading a car magazine. His wife and son were sitting on the other side. She asks if it happens often. Per is kidding he is surprised Annika saw them travelling on the same class. Then comes a little game. Fredrik asks his guests which 3 albums they would bring to a desert island where they would spend a long long time. Jo Nesbø asks Per who he prefers, John Lennon or Paul McCartney and Per chooses John Lennon. Jo and Per can agree on taking The Beatles’ Revolver album. Annika couldn’t really get first what revolver they are talking about, then out of the blue she suggests why not taking Julio Iglesias with them. LOL. Per’s facial expression is priceless. WTF? Haha. Then Annika goes on with Demis Roussos and Per can’t keep it to himself, he says he hopes it’s a big island. Haha. One must love his sense of humor. Per says the 3 albums he would take are Revolver, The Ramones’ first album and Joni Mitchell’s Ladies of the Canyon. Jo agrees on The Ramones’ as well, but he would take Rocket to Russia from them. With this the PG talking part is over (at appr. 40 minutes in), but a fourth guest is coming, Susan Faludi, an American Pulitzer winner author and feminist. It’s worth watching this part, too, because Per stays there in the studio and is listening to Susan’s stories, paying a lot of attention. Then at appr. 53:20, at the end of the show Per performs his new song, ”Småstadsprat”, a duet with Lars Winnerbäck. Lars is of course there as well. In the band you can see Clarence Öfwerman, Christoffer Lundquist, Helena Josefsson and some new faces, Ola Gustafsson, Malin-My Nilsson and Martin Höper. How they perform Småstadsprat live is pure awesomeness! Just magical! H.e.a.v.e.n.l.y.! What a wonderful and interesting show it was! We would love to have more of this, wouldn’t we?